Interstate 276 east at the Norristown interchange with Germantown Pike and I-476 south. The Northeast Extension (I-476) stems north from an unnumbered exit nearby. Photo taken 12/19/16. Interstate 276 extends the Pennsylvania Turnpike east from Valley Forge (I-76) to Norristown, Valley Forge and Levittown. Originally known as the Delaware River Extension the toll road serves through traffic east to the New Jersey Turnpike and west to Harrisburg. I-276 also constitutes a commuter route across the north Philadelphia suburbs in Montgomery and Bucks Counties. Speed limits are posted at 70 miles per hour along the entire length of I-276, with the exception of at the main line toll plaza east of Exit 352 (PA 132), and through the long term construction zone between Bensalem and Bristol. The Pennsylvania Turnpike is six lanes wide from the split with Interstate 76 east to the Bensalem interchange (Exit 351). The roll road will be expanded east from U.S. 1 during ongoing work to complete the interchange with I-95 and I-295. Prior to 2018, I-276 ended at the New Jersey state line along the Delaware River Turnpike Toll Bridge. Signs further east along the New Jersey Turnpike mainline referenced I-276, though the Pearl Harbor Memorial Turnpike Extension west to Pennsylvania was not part of the Interstate system. This changed when the interchange with I-95 and I-295 east opened at Bristol Township. Interstate 276 was formally truncated west to the partial interchange with I-95 and I-295. Interstate 276 east from I-95 to the Delaware River Bridge, and the unnumbered Pearl Harbor Memorial Turnpike Extension, became a part of the new Interstate 95 mainline. I-95 overtook the remainder of the New Jersey Turnpike north from there. Interstate 95 north from I-276 to the Trenton Beltline and east to I-195 became part of an extended Interstate 295 from New Jersey. The Delaware Valley interchange was redesigned to eliminate the trumpet interchange with U.S. 13. A signalized intersection replaces the grade separation between Bristol Pike and the Pennsylvania Turnpike access road. Construction on the Route 13 Connector extends from 2018 to 2020. Section A – Widening and reconstruction of I-276 from west of Pennsylvania 132 (Street Road) to Richlieu Road. This work follows the May 2019 completion of the Bensalem interchange construction at U.S. 1. Section E – Expansion of the Pennsylvania Turnpike westbound to three lanes from the Delaware River Bridge toll plaza to the new flyover for Interstate 95 south. Reconstruction will also take place for the eastbound on-ramp and westbound ramps at the Delaware Valley interchange. Section D30/D40 – Adds the remainder of the ramps between Interstates 95, 276 and 295, replaces the turnpike bridge over Neshaminy Creek and expands I-295 north. Parallel Delaware River Bridge – This will be a part of Interstate 95 when construction starts in 2025 or later on a new span to be added to the south of the existing steel arch bridge. Upon completion, the old bridge will closed for rehabilitation and eventually reopened for westbound traffic. With the establishment of the Interstate system, the Pennsylvania Turnpike mainline received the designation of Interstate 80S west from Valley Forge and Interstate 280 east from Valley Forge. 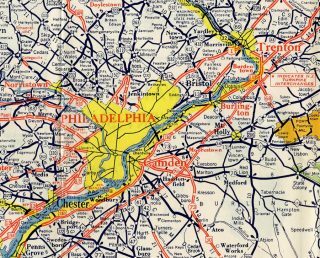 These routes were not posted in the field, and by 1964, I-80S east from Monroeville to Camden was renumbered as Interstate 76. 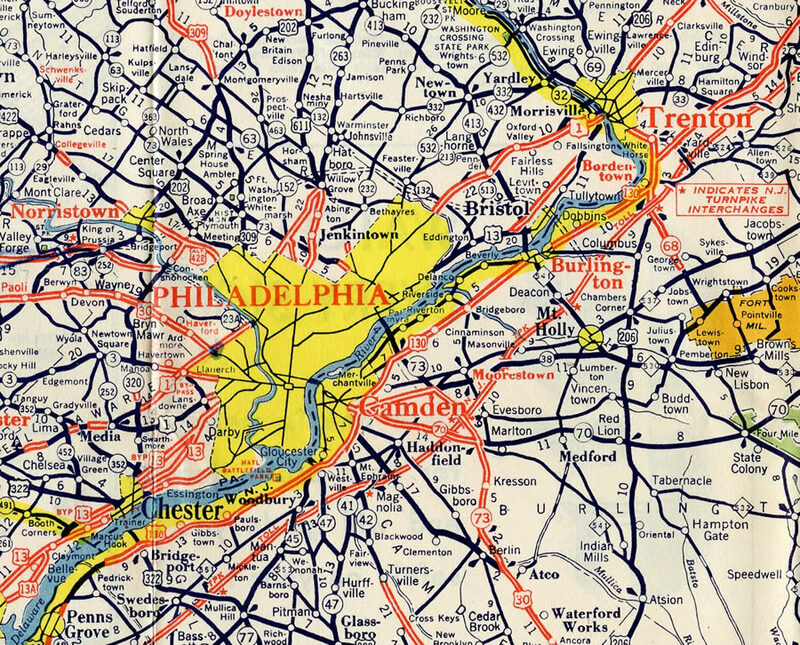 All branch routes for I-80S east were renumbered as well, with I-280 along the Delaware River Extension changed to Interstate 276. Interstate 276 passes under the I-295 mainline just ahead of the merge with I-95 northbound. The succeeding exit is the Delaware Valley interchange (Exit 358) with U.S. 13. Photo taken 12/19/16. The flyover carrying Interstate 95 north onto the Pennsylvania Turnpike mainline opened to traffic on September 23, 2018. Traffic along I-276 east merges with the high speed ramp from the right side. The full build out of the new interchange between the two routes will provide full access with four flyovers. Photo taken 12/27/18. Entering the original trumpet interchange (Exit 358) with the turnpike access road for U.S. 13. The forthcoming toll plaza was demolished by 2015 while the eastbound ramp at Exit 358 was shifted westward in 2016. U.S. 13 parallels I-95 south toward Philadelphia. Northward from the turnpike access road, U.S. 13 ends in 6.4 miles at U.S. 1 by Fallingston and Morrisville. Photo taken 08/30/05. Previously the Delaware River Bridge toll plaza marked the end of the ticketed Pennsylvania Turnpike system. Tolls are no longer collected in the eastbound direction here while cashless tolling commenced on January 3, 2016 for westbound at a new AET collection point. Photo taken 08/30/05. The Delaware River Turnpike Toll Bridge spans the river between Edgely, Pennsylvania and Florence, New Jersey. Rising to 135 feet above the level of the river, the continuous truss bridge connects I-276 and I-95 with the Pearl Harbor Memorial Extension east to Mansfield Township. Photo taken 08/30/05. Mileposts for the Pennsylvania Turnpike extended east to the state line, which lies midway across the Delaware River Turnpike Toll Bridge. These were replaced in 2018 to reflect the distance to Delaware along I-95. Milepost 359.0 was located by the unmarked New Jersey state line. Photo taken 12/19/16. Interstate 95 (Pennsylvania Turnpike) heads west from the exchange with U.S. 13 at Bristol and crosses Mill Creek one mile ahead of the separation with I-276 west. Photo taken 12/27/18. Interstate 276 extends the Pennsylvania Turnpike mainline west from I-95 at Exit 40 to Bensalem, Willow Grove and Fort Washington. Photo taken 12/27/18. Interstate 95 shifts southward onto its original alignment to Philadelphia along a two lane flyover from I-276 at Exit 40. Photo taken 12/27/18. Traveling west from the ramps with U.S. 130 through Florence Township, the Pearl Harbor Memorial Turnpike Extension approaches the arched continuous truss bridge spanning the Delaware River. Built between 1954 and 1956, the span carries four lanes of traffic along a 74.5 foot wide deck.7 Photo taken 03/23/04. Interstate 276 began midway across the 6,571 foot long Delaware River Turnpike Toll Bridge at the Pennsylvania state line.7 Photo taken 03/23/04. The two mile sign for Interstate 76 (Schuylkill Expressway) and Valley Forge interchange (Exit 326) stands at the King of Prussia Service Plaza along Interstate 276 west. Photo taken 12/21/16. Passing north of King of Prussia Mall and south of an area of industrial and office parks, the Pennsylvania Turnpike maintains six overall lanes to the merge with I-76 west. Beyond Interstate 276, the toll road drops to four lanes. Photo taken 12/21/16. A two lane off-ramp (Exit 326) departs for Interstate 76 as it follows the narrow and congested Schuylkill Expressway southeast to center city in Philadelphia. Adjacent ramps connect the freeway with Gulph Road to King of Prussia Mall and Valley Forge. Photo taken 12/21/16. Interstate 76 west overtakes the remainder of the Pennsylvania Turnpike mainline to Harrisburg, Pittsburgh and the Ohio Turnpike gateway near Youngstown. US. 202 parallels the toll road to the south along a freeway stemming west from King of Prussia to Paoli, Malvern and Frazer en route to West Chester. Photo taken 12/21/16. See the Interstate 276 guide at AARoads for photos showing the Pennsylvania Turnpike in 2004. Then the turnpike was still four lanes wide as it traveled west to the Valley Forge Interchange and signs for Exit 326 still referenced I-476. The first guide sign for the Valley Forge interchange appears west of the PA 252 (Valley Forge Road) overpass and Valley Forge Service Plaza. 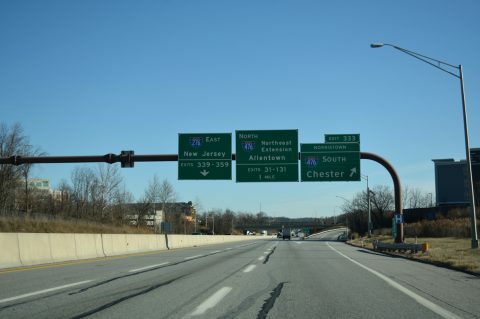 Signs for Exit 326 omit Interstate 276 in favor of I-476, which alludes to the indirect connection made with the Mid-County Expressway at Plymouth Meeting prior to 1992. Photo taken by Chris and Amber Lokken (06/24/08). Interstate 76 splits with the Pennsylvania Turnpike in one mile to join the Schuylkill Expressway southeast to Conshohocken and Philadelphia. Connections with U.S. 202 nearby lead motorists to King of Prussia Mall, Valley Forge National Park (via U.S. 422 west), and the U.S. 202 freeway southwest to West Chester Photo taken by Chris and Amber Lokken (06/24/08). Interstate 276 begins as I-76 turns southeast from the Pennsylvania Turnpike toward Gulph Mills and Conshohocken. I-276 appears here now, but previously the pull through panel at Exit 326 inexplicably featured a New Jersey Turnpike trailblazer. The PA Turnpike otherwise extends another 32.8 miles to the Pearl Harbor Memorial Turnpike Extension in New Jersey. Photo taken by Chris and Amber Lokken (06/24/08). Interstate 76 (Schuylkill Expressway) enters a full cloverleaf interchange with U.S. 202 just ahead of the toll plaza for the Pennsylvania Turnpike (I-276). 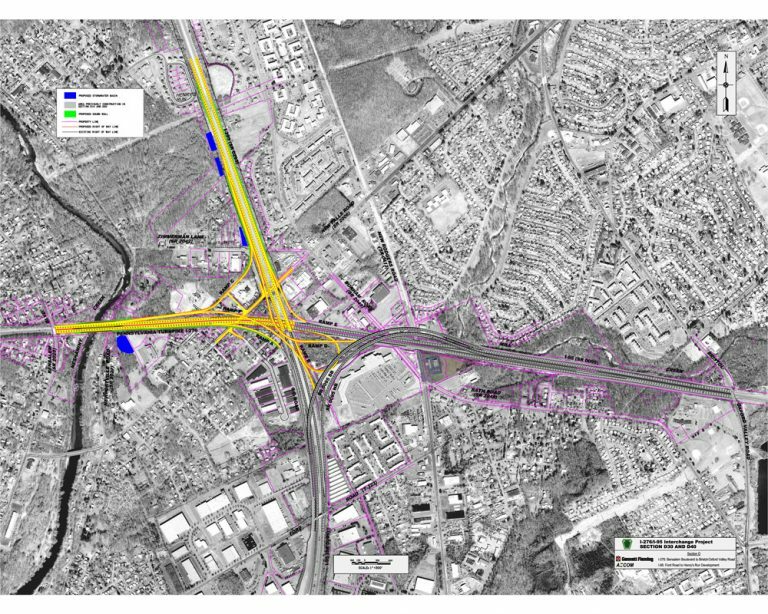 A five-year project reconstructed the exchange with the U.S. 202 freeway to further eliminate weaving traffic by separating movements from I-76 west to the nearby beginning of U.S. 422. Photo taken 12/19/16. The Schuylkill Expressway mainline bypasses all ramps with U.S. 202 (Exits 328B/A) to lead directly to the Pennsylvania Turnpike. Completed in October 2003, the interchange upgrade for U.S. 202 added overpasses for the loop ramps along the I-76 westbound c/d roadway and new distributor roadways along U.S. 202 between U.S. 422 and the Schuylkill Expressway. Photo taken 12/19/16. The collector distributor lanes return to Interstate 76 after the right in right out ramps (Exit 327) for King of Prussia Mall. Traffic slows beyond the merge into a six-lane toll plaza preceding the trumpet interchange with Interstate 276 east. Photo taken 12/19/16. Two lane ramps partition for the continuation of I-76 west to Harrisburg and Interstate 276 (Pennsylvania Turnpike) east to the Northeast Extension (I-476) at Plymouth Meeting, Fort Washington, Willow Grove, Northeast Philadelphia and Bristol. Photo taken 12/19/16. Interstate 76 (Schuylkill Expressway) west at the c/d roadway for Exits 328B-A and 327 during 1998-03 construction at U.S. 202. With the change to the ramps with U.S. 202, the addition of the Norfolk Southern Railroad truss bridge, and the demolition of an adjacent industrial business, the look of this area changed dramatically. Photo taken 10/11/01. Exit 328A previously departed from the c/d roadway as it separated from Interstate 76 west. This movement is now located further from the freeway mainline. The loop ramp from U.S. 202 north here was later elevated to pass over the c/d roadway and merge from the left instead of the right to reduce weaving. Photo taken 10/11/01. Construction underway in 2008 expanded I-76 west to four lanes to the trumpet interchange with Interstate 276 (Pennsylvania Turnpike). This sign bridge, including an overhead with a partially covered PA 9 shield, was eventually replaced with a monotube assembly. Photo taken 08/30/05. Six Lane Widening Project, www.sixlanewidening.com/ PennDOT, project web site. "New Pa. Turnpike &apos;E-ZPass-Only&apos; Interchange Opens in Bucks County." Pennsylvania Turnpike, press release. November 22, 2010. Project Overview, PA Turnpike / I-95 Interchange Project web site. Construction, PA Turnpike / I-95 Interchange Project web site. Design Advisory Committee (DAC) Meeting #11 and Public Officials Briefing, online document. May 28, 2015. Page updated February 13, 2019.